As we've seen with the Platinum cards in the U.S. and U.K. this new automatic elite status option for holders of The Platinum Card here in Canada has arrived! 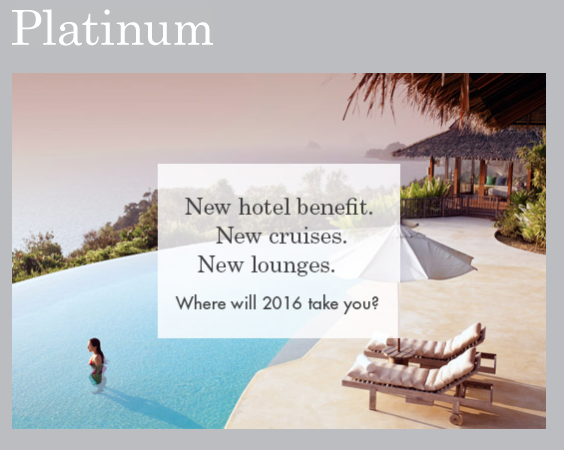 With this new benefit, complimentary Hilton HHonors Gold Status will be offered to Platinum Cardmembers. Gold Status typically requires 20 stays, 40 nights or 75000 base points before a customer can obtain that status. Learn more about Hilton HHonors Gold Status here. Don't have the Platinum Card yet? You can apply for it here! How about you existing cardmembers? Are you excited to finally see a new elite status benefit added? Granted it doesn't replace the lost Cathay Pacific status but it is a nice addition especially seeing the card will likely lose Starwood in a year or two. 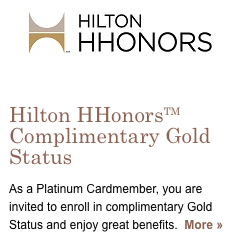 For me I already have Gold Status until 2017 however my wife will definitely upgrade her HHonors status now! New Platinum Card® Cardmembers, earn 50,000 Bonus Membership Rewards® points by spending $1,000 in purchases in the first three months of Cardmembership.